JGB is an American rock band led by Melvin Seals, who plays electric organ. Its mission is to continue the musical legacy of the Jerry Garcia Band, of which Seals was a long time member. As noted in Rolling Stone, "... when Garcia passed away in 1995, and the Grateful Dead went on hiatus, Seals took charge. Under his leadership, the slightly renamed 'JGB Band' pays tribute to Garcia by performing his songs and remaining faithful to his style." In 1996, Seals played several concerts with Jerry Garcia Band bassist John Kahn and other former members of that band. Their idea was to continue playing the same music with everyone except Garcia himself. However, Kahn died three weeks later, and Seals and the others continued without him. The membership of JGB has continued to evolve over the years. On July 30, 2004, Melvin Seals was the first Jerry Garcia Band member to headline an outdoor music and camping festival named in honor of Jerry Garcia, called Grateful Garcia Gathering. Jerry Garcia Band drummer David Kemper joined Melvin Seals & JGB in 2007. To date, other musicians playing with JGB have included Donna Jean Godchaux, Mookie Siegel, Pete Sears, G. E. Smith, Barry Sless, and Robin Sylvester. 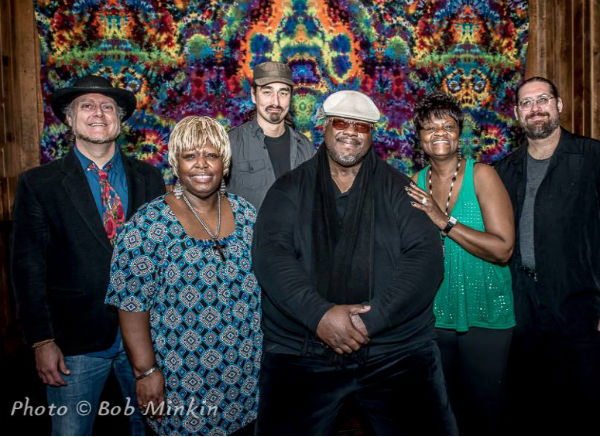 Melvin Seals and JGB at Taos Mesa Brewing, Taos New Mexico, December 29, 2016. Audience recording from dead center front of stage. Source: Recorded on Sonic Studios DSM-1S mics to a Tascam DR-07mkII digital recorder dead center front of stage. On Feb 21, 2006, we received permission for certain JGB shows to be hosted at the Archive. Permission does NOT extend to JGB shows during Jerry's life, but only to later shows, often billed such as "Melvin Seals and JGB." Please respect this important distinction when uploading, thanks! There is a separate Melvin Seals section here as well for other work.